post.scripting is a blog series that transposes the question from Curating Lab’s Public Symposium “Where Does an Exhibition Begin and End?” to an online platform. It asks, “Where Does a Conversation Begin and End?”. It seeks to expand upon questions around curation and art brought up during the Public Symposium, examining the ideas behind words and the philosophies beyond thoughts. About "When Does An Exhibition Begin and End?" Part of the Curatorial-Intensive, the public symposium "When Does An Exhibition Begin and End? "presented Curating Lab 2014 participants with an opportunity to reflect on the role of a symposium and its public within curatorial practice. Building on lectures and workshops with facilitators Max Andrews and Mariana Cánepa Luna from Barcelona-based curatorial office Latitudes as well as artist, curator and writer Heman Chong, participants engaged with the symposium by live-tweeting proceedings, mapping concepts of the discussions, and devising approaches such as blogging to document and report the day for those not physically present. In response, participants Luca Lum, Chua Ying Qing and Raksha Mahtani conceived the blog series, post.scripting, featuring in-depth interviews with the artists and curators involved in the symposium. In this week’s post.scripting interview, our interviewers leave earth behind. They talk to visual artist and writer Shubigi Rao through the pixellated world of email correspondence. Shubigi’s interests range from archaeology, neuroscience, 13th century ‘science’, language, libraries, historical acts of cultural genocide, contemporary art theory and natural history. 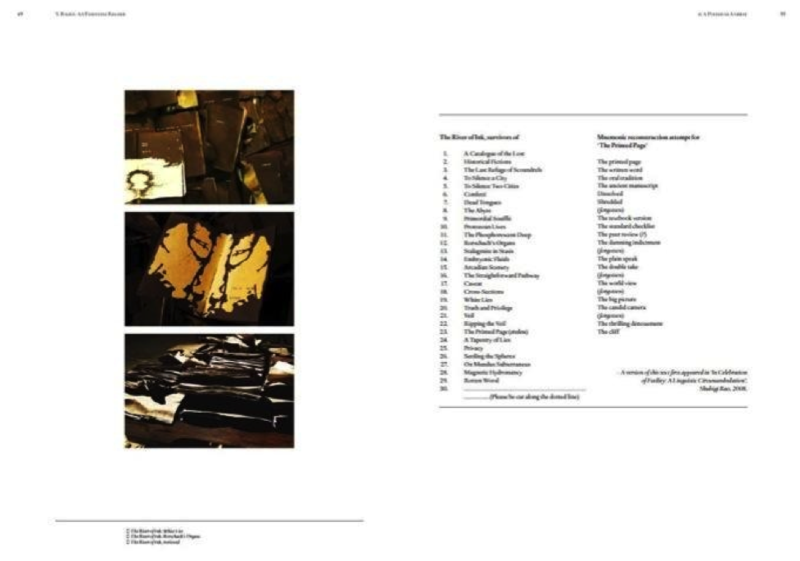 Her work involves complex layered installations comprising handmade books, text, drawings, etchings, pseudo-science machinery and archives, and has been exhibited and collected in Singapore, Indonesia, Iran, Hong Kong, China, the Netherlands and India. Shubigi is perhaps most well known for her works documenting the findings of the late S. Raoul, which tread the boundaries of fact and fiction. She recently exhibited her lecture-performance, Visual Snow, at The Disappearance in 2014 at the Centre for Contemporary Art, Singapore. Some of her notable exhibitions include the solo The Retrospectacle of S. Raoul (2013), group shows Still Building (2012), Beyond LKY (2010), Found and Lost (2009), The Tuning Fork of the Mind (2008). During the Public Symposium, Shubigi restaged a version of her lecture-performance Visual Snow, where she tackled the symptoms of museum fatigue, over-exposure to video art, and the trauma of post-exhibition ‘tear-down’. Hello! We are reporting on the Public Symposium for Curating Lab 2014. We would like to ask you both a couple of questions on your work, specifically, Visual Snow, and some things in regards to S. Raoul. Please contact us if some questions seem vague or opaque, or otherwise feel free to interpret them however you will. Feel free to engage with them by asking more questions, and we can pass the ball back and forth and perhaps forward the conversation. As you know, S. Raoul is a posthumous figure, so it leaves me with the dubious pleasure of having to speak on his behalf, but since I was his biographer, protege and unpaid lab rat, with exclusive access to his materials and by extension his mind, it shouldn't be too hard to speak for him. >>CL: You talked about how the role of biographers is very similar to that of curators. What is the relationship between art and curation? How does the curatorial feature in your work? More specifically, how does your work interrogate/mobilize/play off the curatorial as a mode or form? S. Raoul saw curating as being akin to literary biographies, and even wrote a monograph on the subject, Bastardising Biography: An Extraordinary Initiative. He tended to be very critical of uncritical retrospectives with fraudulent theoretical understructures, which he dismissed as glorified 'literary gossip', where talking points and milestones were generated in hindsight. He was, as you can imagine, a difficult man. It was therefore with a certain vindictive joy that I curated a retrospective of his work over the last decade, The Retrospectacle of S. Raoul (2013), and even authored a speculative biography of him. To answer your question, yes, the nature of curation has been of absorbing interest to us, whether it involved the examples above, or examining the precinct of the gallery bookshop in No Cover No Colour (2006) with its curated selections of one-off exhibition catalogues interspersed with critical texts and more definitive' anthologies. We both saw the curated group show as analogous to the unseen taxonomies at play in a compendium, say, like Vitamin D.
>> CL: How did you come about working with the infamous S. Raoul? Could you elaborate on your choice of a male alias modelled after a photo of yourself in (for want of a better word) drag? 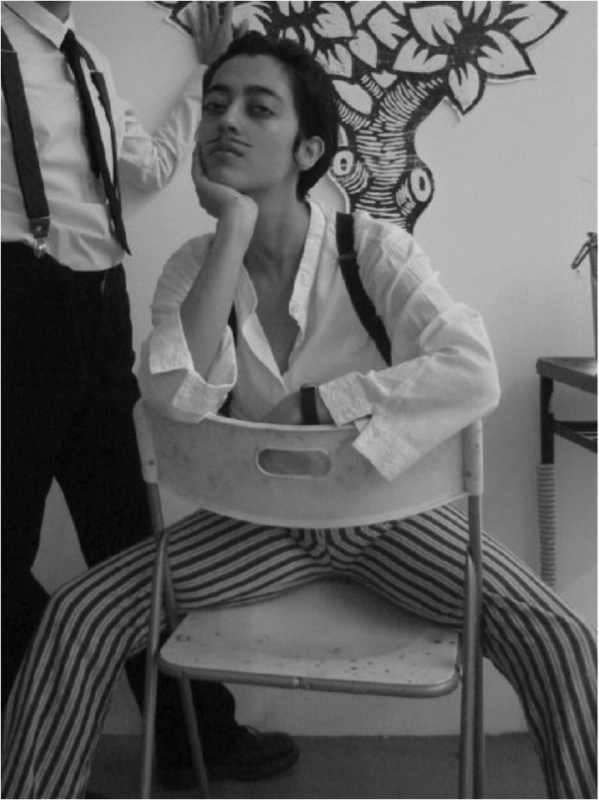 He's a paper tiger really, a de-gendered, de-ethnicised me with a paper moustache, cocking a snook at the ridiculous assumptions made about female authorship, authenticity and the feminine nature of certain forms of art-making. For example, even in densely scientific endeavours, there are poignant hints of loss in S. Raoul's life, that have been lauded as being the hallmarks of a flawed, tragic and poetic character, yet have been dismissed as 'romantic' and feminine when presented under my name. In another example, I was once referred to as the 'girl who plagiarised S. Raoul' when 3 books authored by him were displayed in SAM under my name. There is this ridiculous and wholly arbitrary assumption of how men make art, and I wanted to free the work from that ridiculous assumption, from the myth of the artist persona, for which a completely ridiculous and fictitious persona has worked very well. I have been the booth girl explaining S. Raoul's pseudo-neuroscientific work, The Tuning Fork of the Mind, to a Nobel Laureate in the field, and watching it get accepted fairly uncritically because it was authored by a dead white (?) male and presented by a young (at the time) female protege. >> CL: In your presentation, Visual Snow, you mentioned that very often documentation supercedes the experience. How is the failure of memory mitigated by efforts at documentation process? They are desperate attempts to impose order, when the disorder of the choices made (what is remembered, what is not) is perhaps of more note. You can see the wistful, subjective nature of such documentation more clearly (albeit in very low resolution) on display in the image I've attached here, where a book stolen from River of Ink at an opening was never documented, so the sole record of its existence is present here in a futile attempt to reconstruct the content from entropic memory. Even an eidetic reconstruction would fail, for the book is not just that content. The documentation includes the theft, the loss, the inability to accept that loss. So yes, the documentation is as much a reminder and commemoration of that failure. Additionally, all documentation, textual or pictorial, has huge gaps which too allow for a sort of delicious incomprehensibility. I'm afraid that I don't know what you're implying here. Luckily I'm constrained by a non-disclosure agreement as part of an ongoing lawsuit and therefore unable to address your question, on the record at least. prospective curators - suffer from? What are some strategies to mitigate these occupational hazards and traumas that result from curating, from attempting to narrativise, to craft a message, to make things understandable? Prospective curators are most susceptible, as in their eagerness they have all channels open, so to speak, and are subject to more exposure than the jaded and therefore inured curator. There are numerous occupational hazards here, like the inability to string a comprehensible sentence post-exposure, and a tendency to stay true to one's mentoring with isolated brief, brave forays of one's own to maintain the illusion of autonomous thought without really rocking the curatorial boat. To quote S. Raoul, "Notable symptoms include the paradoxical yearning for a intangible, enduring work, a substantial gesture, a temporal performance that doesn’t end, a distaste for jargon yet a continuing fidelity to it, and perhaps worst of all, where they begin to imagine art when none exists”. Strategies include allowing your eyes to glaze over (the body's natural barrier to the contagion of overexposure), especially when faced with 'senior' curators holding forth, and refraining from nodding eagerly, as this directional movement of the cervical vertebrae increases cranial blood flow, an unwitting transportation device for hyper-aggressive drivel, ponderous declamatory positions and other forms of exposure. You should also take everything with a pinch of salt, as it is a belief widely accepted to be true that salt can ward off the evils of vampiric over-intellectualism and pretend-objectivity. It may give you hope to know that experiments involving the application of salt to the leeches of the art world have been astoundingly successful. As for making things understandable, that should not be your role beyond the necessary unpacking of that peculiar phenomenon - the artist's intention. The need to comprehend lies squarely with the viewer/reader/listener, for as we have been told, the Death of the Author = the Birth of the Reader, and this should liberate you from the need to pander, spoonfeed, or otherwise 'make things understandable'. I hope this has been of some use to you, and to those on whose behalf you emailed me. Do let me know if you'd like additional materials, or have further questions. 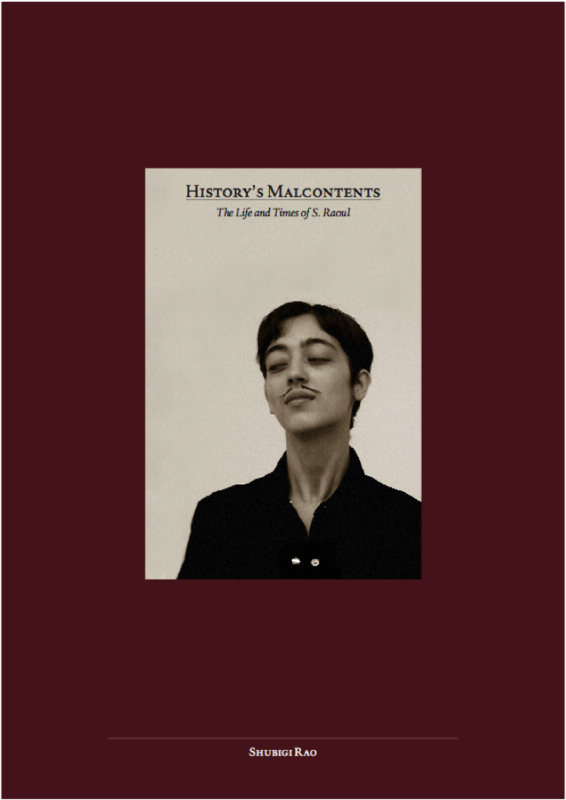 A useful text for furthering your state of befuddlement would be History's Malcontents: the life and times of S. Raoul, available at ICAS, Lasalle. Alternatively I can send you a preposterously large pdf of the book, if you think it will be of any use. Bastardising Biography is unfortunately out of print, but I can provide a copy for you when I get back to Singapore in early August.